Thank you very much for the payment, this is my first payment on this campaign. "7. Negative trust account can't join." I don't have a VALID negative trust rating. You should change your trust list and READ all feedbacks. And this, it is not enough? Stop spamming and start reading. You are not in charge here. 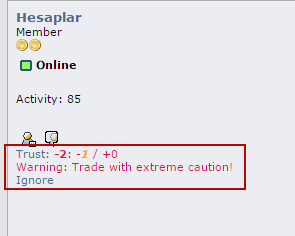 I think secondtrade will not accept you why? Because you have negative trust has the op state there that one requirements is must NO NEGATIVE TRUST. Check 60 of your last posts, 57 of them are one-liners excluding this post as this is your third 2 liner post. Do you expect secondstrade to be paying for that spam? Ok, but in the OP there is no rule that one liner post doesn't count, and my post is related to the topic, is it spam? Did this campaign have characters minimum in one post ? In my post i'm not ever say "me too" or "thanks"
OP will pay constructive post right ? It doesn't matter how much characters we post. I counted 14 retard spammers from your compagn which want to make an easy profit by posting random numbers without following the game. I have suggested that he removes Games and Rounds and the Local boards as well (no idea why he pays for those when most of the other boards are disallowed and those two are obviously the boards that can be easily abused). Usually signature campaign count 75 character as standart to judge it was constructive post or not. For example you can check bitmixer.io signature campaign rules. I think you're mistaken. There's a 50 post max per week restriction but if there was one on the number of characters 90% of people here wouldn't be getting paid.